I believe that, at some point, a vendor will decouple their delivery tier from their management tier and spin it off as a separate product that works with other vendor’s management systems. EPiServer CMS v6 R2 has one of the best features I’ve seen in a CMS in its Visitor Groups. This feature lets you develop criteria to profile demographic groups – you can put all people who come from monster.com, for instance, into a “Potential Job Seeker” group and then morph your site for them – highlight a different featured link, for instance, or even show different content down to the paragraph (even sentence) level. So, it’s got me thinking – how long before someone abstracts this feature? It happens to be part of EPiServer now, but it could really be done with any CMS… or without one. How long before someone develops some CMS-agnostic system that runs in the delivery tier that provides this functionality? They’ll sell some connectors, of course, that make it work gracefully with the popular CMS, but it would stand on its own. Overnight flight on Virgin Atlantic to London to hang out with Max, Stijn, and Roman for the weekend and talk Camayak. 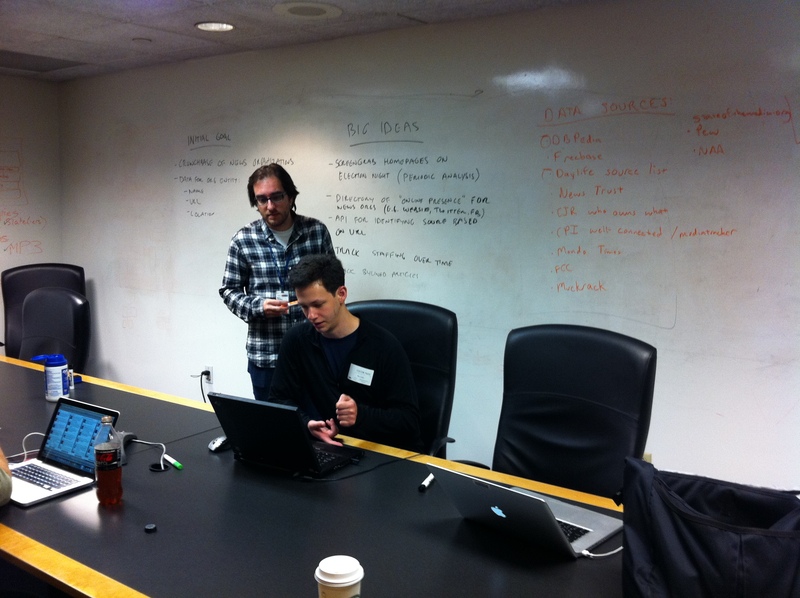 Marc Lavallee and Max Cutler earlier today identifying different sources of news organization data. As a part of the Hacks/Hackers post-ONA hackathon at NPR, we rekindled NewsAnalyzr. The core idea is to build a flexible tool for analyzing the news and those who make it. A necessary foundational element is a structured database of news organizations with pertinent metadata like URL, print circulation numbers, or number of employees. Once you have this, you can, say, easily create an API to give you the title of a news organization based on URL or scrape the homepages all top 200 newspapers on a 15 minute interval during election night. You should follow our progress on GitHub and I’ll write a more detailed post we have something useful to show of the project. What aren’t we going to build? The question isn’t what are we going to build, but really what aren’t we going to build? The Open Assignment Desk (formerly known as the Virtual Assignment Desk) is a tool for leveraging openness in the story creation process. Hat tip to Jay Rosen and Dave Winer for talking about the left side of the same idea in episode #12 and episode #18 of Rebooting the News. It brings the funk in stages. Posted byDaniel Bachhuber August 7, 2009 Posted inpostsTags: CoPress, Courant News, CRM, David Estes, Edit Flow, editorial workflow, ideas, journalism, Max Cutler, news CRM, Portland, virtual assignment desk5 Comments on What aren’t we going to build?